Legal empowerment organisations help people use the law themselves to solve their most pressing justice problems. These problems don’t necessarily capture headlines—for example, obtaining an ID or getting advice on entitlements when leaving a marriage. In many countries, services to help poorer segments of society with such legal problems are typically provided by NGOs, often financed by international donors, with occasional pro bono contributions by lawyers. But reliance on external funding has in some ways acted as a hindrance to innovation. It can make organisations vulnerable, can lead to poor spending decisions (including overreach), can make organisations unaccountable to beneficiaries, and it’s impossible to scale up assistance to the level of actual need. For example, according to Open Society Foundations surveys in 2012, in Tajikistan, 74% of respondents had a legal problem in the last three years, and in Macedonia the figure was 50%. Donors simply cannot fund to this extent. State funding can fill the gaps in some places—especially in non-controversial, intra-community cases—and such funding is in fact increasing in several middle-income countries, such as Ukraine and Indonesia. But in low-income countries, many governments still struggle. Local organisations need to be more inventive and adaptable in finding new business models. While donor and government funding is important, organisations need to adopt hybrid models of financing, balancing risk and improving efficiency by using several models at once. Most legal service providers (whether state, NGO or private) aren’t well equipped to do this, whether because of regulatory restrictions, lack of business experience, or a sense of reluctance—small contributions can be more time intensive than large grant applications. Yet introducing hybrid systems of financing can hedge against reductions in one source and allow concentration on the real needs of clients. While donor and government funding is important, organisations need to adopt hybrid models of financing. With this idea of hybrid funding in mind, there are many options for alternative revenue sources, including: 1) social enterprise models sourcing contributions by users (whether as low cost services or as membership fees); 2) local community contributions; 3) side enterprises; 4) building investments to provide an ongoing return; and 5) required corporate contributions. Social enterprises are organisations relying on commercial revenue to achieve social purposes. There appears to be a market for low cost services: targeting this middle group may be a more effective business model than focusing exclusively on the poorest segments, saving scarce resources for that group. These could entail a small service fee, or a membership fee. For example, in Holland and South Africa, low cost legal insurance is popular; in Rwanda, Microjustice for All reduces costs by bringing together small-scale businesswomen who need IDs for trade and are happy to pay a small fee to hire a bus together to get registered. 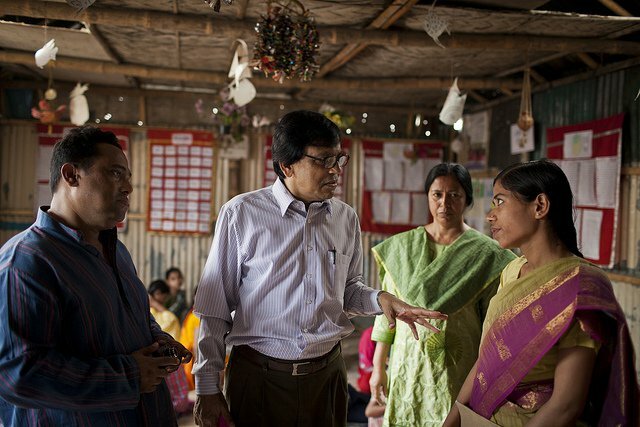 In Bangladesh, BRAC requests donations from users who are able to pay for legal assistance. In the UK, a legal cooperative offers reduced fees to members, and in Sierra Leone a market women’s association pays a small regular fee to cover work-related legal assistance for members. A BRAC director in the field in Dhaka. In Bangladesh, BRAC requests donations from users who are able to pay for legal assistance. Some legal communities, however, are protective against low cost services; in fact emerging legislation recognising paralegals (as that currently being drafted in South Africa) sometimes specifies that legal assistance organisations cannot charge a fee for paralegals’ services, typically to assuage the local Bar. Governments need to help these small private sector enterprises by levelling the regulatory playing field, and by breaking down market barriers like over-complicated registration processes. Sourcing both user and philanthropic local contributions is important to raise local awareness of local legal problems, and ensure local accountability of services. For example, Better Life in Egypt fundraises locally to take cases of particular interest to residents. Some communities contribute in kind, by providing furniture (e.g., Community Advice Offices in South Africa), or land on which to build a permanent office (e.g., Timap in Sierra Leone). Local government, paid for by local taxes, often provides infrastructure, as in Ukraine and South Africa. But where government funding is insufficient, side businesses can supplement organisational income: in South Africa, legal advice offices host dances, grow vegetables and recycle waste; other organizations, such as the global organisation Namati, subcontract their staff to undertake consultancies or provide training to others, subsidising costs. Another approach is to build investments to provide an ongoing return. This might start with a donor who gives funds for an endowment, or a member of the community who bequeaths a house when he or she dies, and then is built on through small contributions from side enterprises. The central idea is to have capital that can be invested (or rented out), and on which only the returns—usually between 2-8%—are used. These can provide a long term basis for institutional security, encouraging careful spending. Examples include Sarhad Rural Support Program in Pakistan ($5m core endowment from the Pakistan Government, and $400,000 for legal services from OSF); and the Association of University Legal Aid Institutions Trust, South Africa ($500,000 from Ford Foundation). Donor rules on spending are not always conducive to the establishment of endowments, but for trusted organisations they should be. Governments could also do more to kick-start the market for legal services, requiring corporate contributions. The governments of India and Nigeria, for example, have designated other sectors as priority areas for investment, in which a certain percentage of their investment or profit must go into that sector. Alternatively, governments could require corporate contributions to legal services as a requirement of doing business: in Sierra Leone, draft legislation will require businesses with large-scale land investments to pay into a basket fund for legal services for affected communities. These could work best for sector-specific legal problems rather than intra-community problems. Indeed, different types of problems are particularly amenable to funding from particular revenue streams. Employment issues, for example, may be particularly amenable to social enterprise or membership models but unlikely to attract philanthropic contributions. Access to service problems may attract community contributions but corporate contributions may not be relevant. To take a hybrid approach is to recognize that particular issues are suitable to specific types of funding. Thinking in this way could be a starting point for walking through business models for addressing particular types of legal problems. Finally, in addition to different sources of funding, there also needs to be more focus on reducing costs through unbundling (breaking out parts which complainants can take on themselves, and bringing in expertise for specific elements when essential), and utilising technology to deliver legal assistance more efficiently. Further approaches to financing, with examples from other sectors, can be found in a recent report by Law and Development Partnership. Existing donors should be actively encouraging hybrid financing, in places making funding dependent on it, and assisting organisations to build internal infrastructure to allow for such diversification. Most organisations are, naturally, very keen to find ways to make their work more financially sustainable, and legal empowerment practitioners are always seeking suggestions. And yet, innovations to date have been in isolation and small scale. It’s time for something bigger.